Strava introduced their heatmaps and their Strava Slide tool at the Washington DC conference of the OSM US community SotM-US in the spring. I had a quick look at the time and it seemed interesting, but there was little data in areas which I map. A question came up recently regarding how accurate the Strava heatmaps are for mapping routes on OpenStreetMap, particularly in wooded areas. This prompted me to have another look at the data. I don't know how Strava collect their data, but clearly they have many more data points than the most assiduous individual on OSM might record. 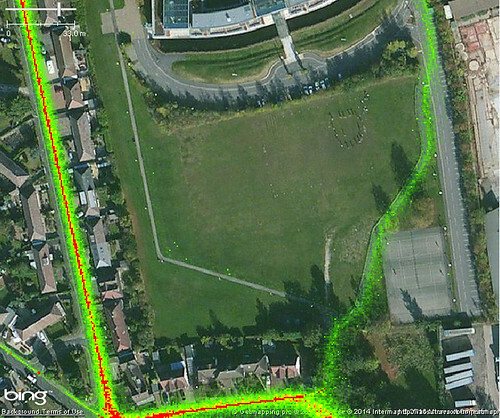 Also even when there are no trees or other sightline obstructions, recorded paths can be quite variable (in general my Garmin will claim an accuracy of 3-4 m in the above area). Now, 6 months after the US conference, there seems to be a lot more information in Britain and other places in Europe. My first Strava based edit was to add an old mule path in Glarus canton in Switzerland. I walked this path back in 2001, but because it is largely through a N-facing wood it was not possible to discern it on aerial photos. 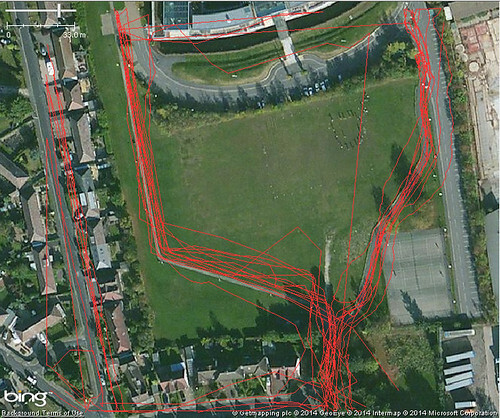 This is a great example where additional external data can facilitate adding something to OSM. In the countryside around British cities it is now becoming possible to refine traces of paths (and indeed identify which ones are likely to Rights of Way) from the density of traces. So in summary Strava heatmaps look like a really powerful addition to the mapper's armoury, and where there are many people using Strava it is likely to be more accurate than collected OSM traces.